First Sentence: On a January evening of the early seventies, Christine Nilsson was singing in Faust at the Academy of Music in New York. I finished reading The Age of Innocence quite some time ago, and then life got hectic and I put off writing this review for far too long. 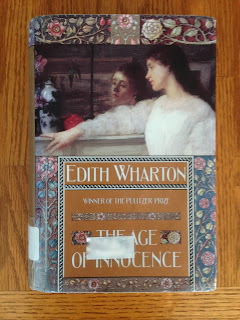 Despite its being further up the list than The House of Mirth, and the fact that it won a Pulitzer, I liked The Age of Innocence less than Edith Wharton's other novel on The List. This one wasn't as funny or as brutal. It's the story of poor little rich boy Newland Archer, a terrible name choice because his fiancee is called May Welland, and keeping the As, Ds, Es, Ls, and Ws straight is occasionally a real struggle here. Archer and his fiancee are rich in 1870s New York, which means they get to do nothing all day and are hemmed in cruelly by their rigid society. What I'm trying to emphasize is that it's hard to empathize with characters like this when you're coming home and reading the book in snatches after working overtime at your punishing job. Anyway, Ellen Olenska, May's cousin, appears at the beginning of the book, having fled an abusive husband in Europe. Archer falls in either love or lust with her, and the rest of the book is just hijinks between the two of them trying to decide whether to be together, and at what cost. Maybe I Just Don't Get It but I honestly have no idea why Archer and Ellen Olenska are attracted to one another. Like seriously zero. Ellen's cool, I guess, but Archer is barely likeable. He's kind of smart, kind of a feminist, but also utterly boring. He reads books, which I suppose is a cool character trait. I think there was something "blah" about all of the characters in the book, though, I just can't put my finger on exactly why I felt that way. I'm not sure how to wrap up this review. I didn't hate this as much as I may be making it seem. It was just too much privilege and not enough chemistry. "If only this new dodge for talking along a wire had been a little nearer perfection I might have told you all this from town, and been toasting my toes before the club fire at this minute, instead of tramping after you through the snow," he grumbled, disguising a real irritation under the pretence of it; and at this opening Madame Olenska twisted the talk away to the fantastic possibility that they might one day actually converse with each other from street to street, or even—incredible dream!—from one town to another. This struck from all three allusions to Edgar Poe and Jules Verne, and such platitudes as naturally rise to the lips of the most intelligent when they are talking against time, and dealing with a new invention in which it would seem ingenuous to believe too soon; and the question of the telephone carried them safely back to the big house. She smiled a little under her wet lashes. "I shan't be lonely now. I was lonely; I was afraid. But the emptiness and the darkness are gone; when I turn back into myself now I'm like a child going at night into a room where there's always a light."